Artist Alexis Rockman drew this for the cover of Peter Ward's book "Future Evolution." 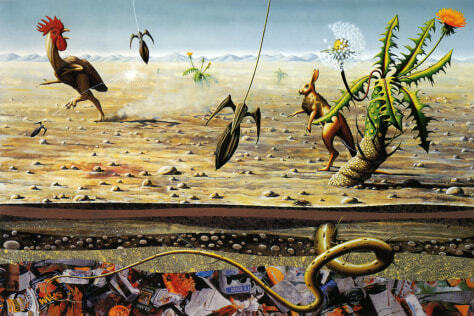 Titled "Neozoic Era" after the geological time we live in, the piece shows human trash buried by dirt that's become a habitat for super-rabbits that can run great distances, and for dandelions whose spores bombard Earth. Click on the image to hear Rockman describe his process.